Cate Blanchett Goes Un-Photoshopped for Mag Cover – MSN Entertainment – Wonderwall. 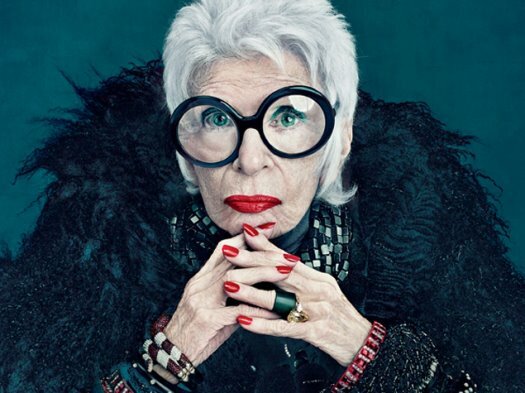 This goes along with the amazing MAC Cosmetics ad campaign featuring 90-year-old Iris Apfel, who designed one of their new lines. Check out this link for more information. I love this photo of Cate Blanchett on The Economist cover and that of Iris Apel for MAC. So many times we are offered such ridiculously photoshopped images of beauty that the real person would be unrecognizable. If we look at the photo above and feel shocked to see lines on the 42-year-old Blanchett, it’s likely because our eye has been trained by photoshopped images to see beauty only in smooth skin and youth. But beauty is so much more than that, it goes to the heart of who a person is, and their experiences are a large part of that. What if each of us learned to look beyond perfection and find beauty in who someone really is? What if we looked at sparkling eyes, a loving smile, an intelligent expression, a deep kindness, and allowed ourselves to fall in love with true beauty? I think it’s time we gave it a shot. It’s time to let go of the sanitized, smooth, plastic version of beauty that we’ve been sold and learn to love true beauty. Look in the mirror, my friend, look in the faces of those you love, that’s where you’ll find it. This entry was posted on March 22, 2012 by Jennifer Shewmaker in Acting, Recognizing and tagged Beauty Redefined, Body image, culture of celebrity, distortion of beauty, women and beauty, women and power.